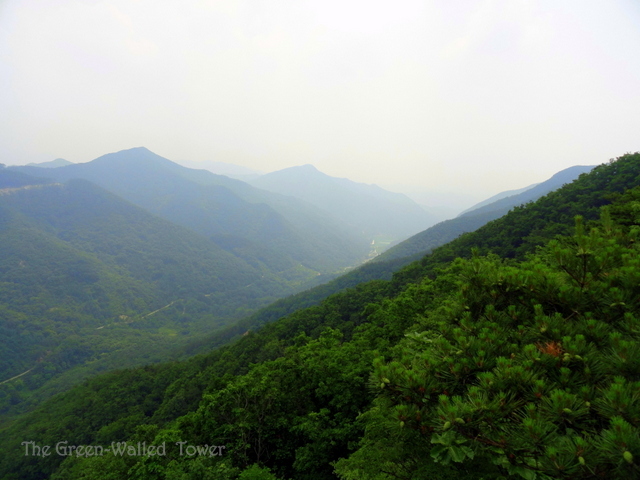 Once upon a time, in the far-off country of Korea, lived a man named David who liked to hike. One Thursday, the government said that there would be a holiday to honor soldiers who died in war, so David decided to go hiking. The weather was hot, but he decided to go on a course of four mountain peaks. First he assembled his inventory. David also brought his trusty Staff of Walking (+2 Hiking, +3 Attack versus spiderwebs) and put on his magical Boots of Hiking. They were 16 years old, so while this gave him +2 to Nostalgia, they also made him -3 resistance versus blisters forming. You can’t have everything in life. David took a crowded bus to a nearby valley that was green on all sides. He started at a temple at the base of the first mountain. The initial climb was brutal. The weather was hot and the air was still and sweat stung his eyes. 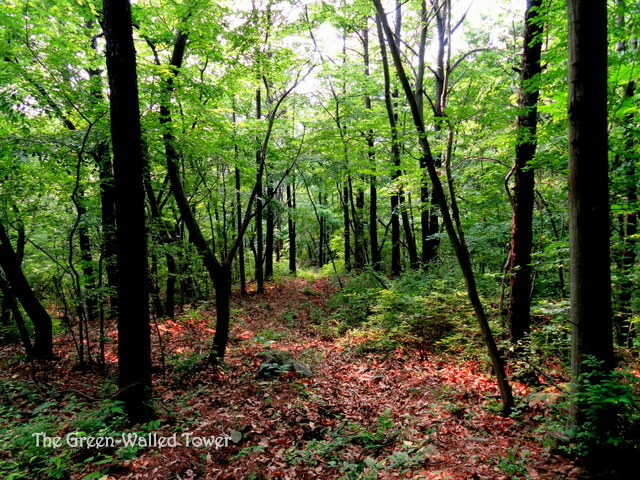 Still, he pushed on and the slope gradually leveled out to a nice path between tall trees. Nearer the top, there were breezes that cooled him a little. 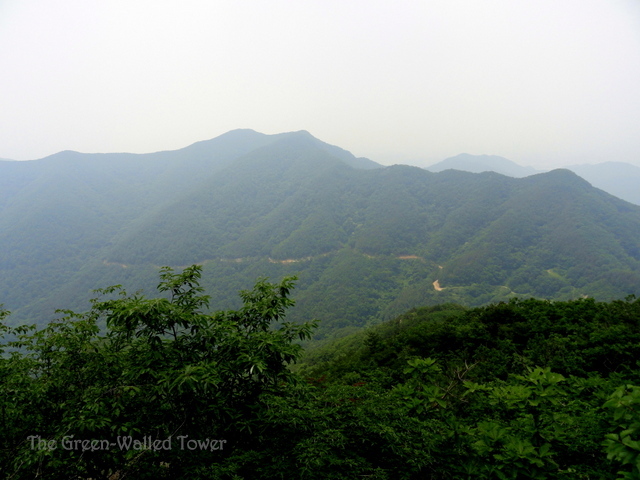 An hour later, he got to the top of the first mountain, Jongnamsan. So far, he had seen no people. The path between the first and second mountains was much easier. For most of it, David walked along on a level, shady forest path. Here, there were more people (14 in all, and one dog). 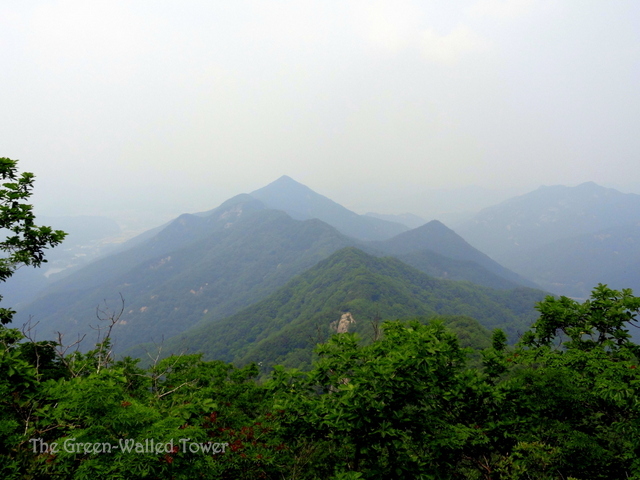 The second mountain peak Seobangsan was empty and barren and had a place for a helicopter to land. It was hot and David didn’t stay there long. As he started to descend, David caught a glimpse of the valley he had traveled along. The air was hazy and the distance faded out into white. The flies were becoming annoying. There were no biting flies or mosquitoes, but there were millions of flies around. There was a dull roar in the otherwise silent woods from the sound of their combined humming. The path went steeply down to a low pass between the second and third mountains. On the way, he passed a tall stone gate that was blocking his way. Just as well it wasn’t a solstice or midnight or anything or he probably would have been whisked away to another world. 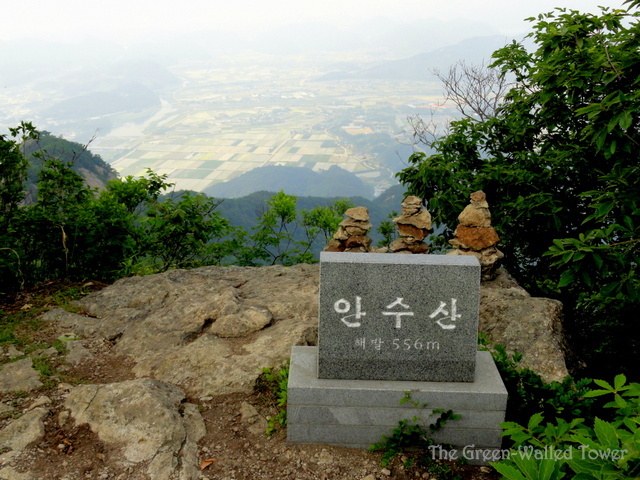 On the pass between the mountains, he met a Korean couple and advised them on the routes to take, as well as informing them that the map board that was located there had been printed backwards (for some reason). Then he set off for the third mountain peak. 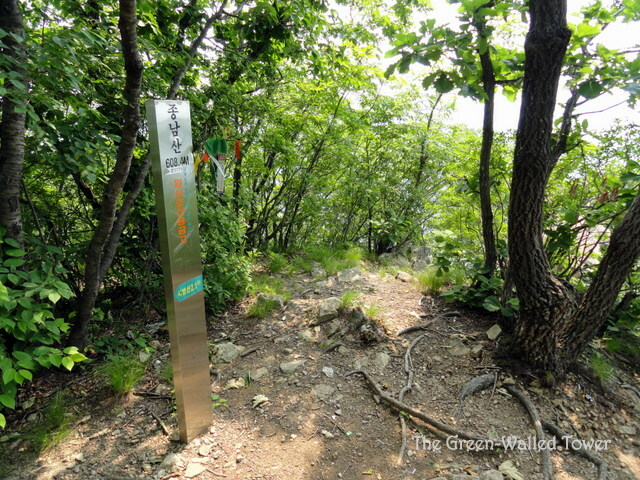 The third mountain was the most difficult. It was taller than the others and by this time, four hours into the hike, David was getting very tired. He struggled up the steep slope and up and over some deep clefts in the ridge until he was able to look back at where he had come from. He saw that a narrow road was being built all around the valley. This disquieted David a lot, since the only reason he could see for it was logging and he hated to see the beautiful valley he loved so much logged and denuded. 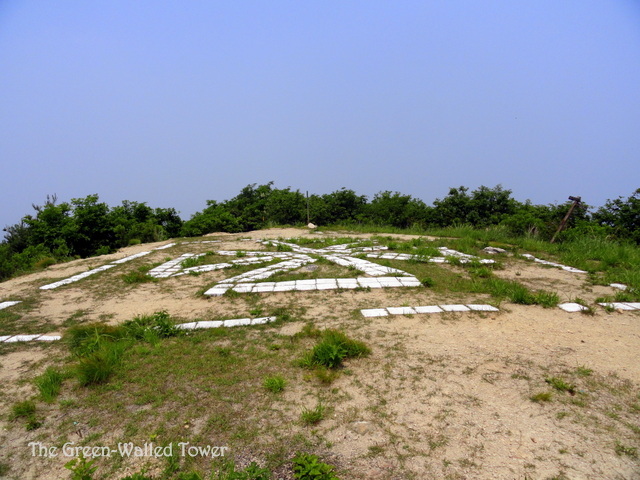 The third mountain, Seoraebong, was at the intersection of three mountain ridges and now David left the first valley and struck out onto a new ridge, an almost straight line to the last mountain at the very end of it. This last ridge was much easier in some ways, but by this time David was very tired and his knees were hurting. 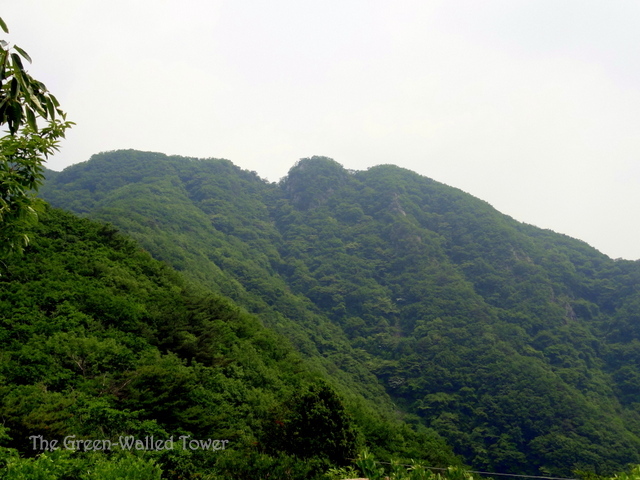 Looking back, he could see the double notched ridge of the third mountain. 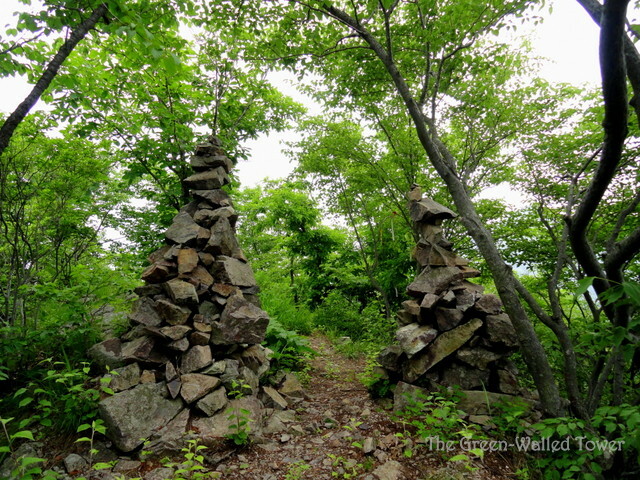 Along the way, he passed many interesting things, like more stone cairns and towers, plus the Wood of Confused Pines. They went in all directions, as if they had had a fight when deciding what direction to grow in. Finally, David reached the final mountain peak, Ansusan. It looked over the prosperous farming region of Gosan, where newly-planted rice fields were laid out in neat rectangles as far as the eye could see. Coming down from Ansusan was much more difficult than going up the first mountain. 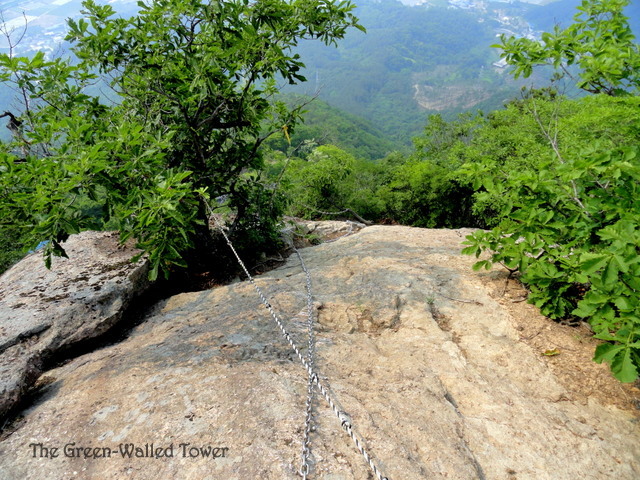 The slope was steep rock and David had to use ropes and chains to hold onto as he went down. The first time David went down this slope was in the dark. On Halloween. The path kept going down steeply. 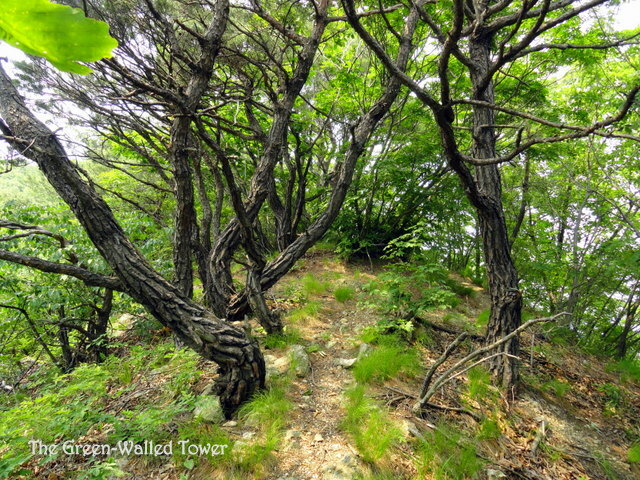 After it entered the trees, the path became more dangerous, with loose rocks and fallen leaves covering everything. 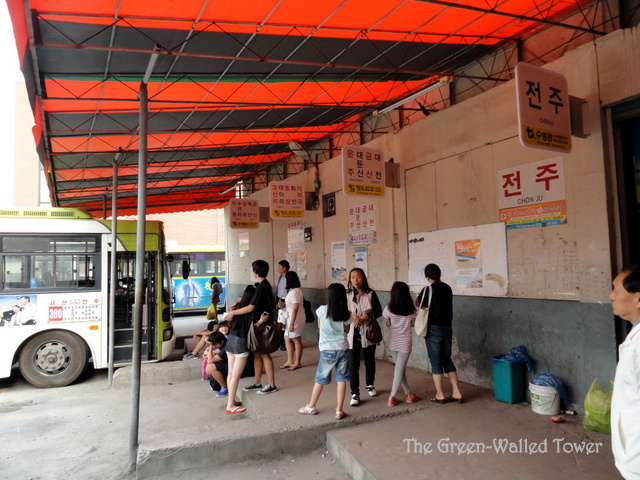 Finally, 8 hours after getting off the bus, David arrived at another bus terminal and waited with other hot people for a bus back to his city of Jeonju. It was a long, hot day and he was very sore and tired, but overall it was quite magical. Kermit Allan Mercer lay in a hospital bed, trying not to listen to the maddeningly incessant beep of the equipment that stood around him. Both his legs were broken and four ribs were cracked. But he had had worse injuries in the past, and considering he had been hit by a bus—tripping on the curb and falling into its path—he couldn’t complain. “Hey, Big Al!” he heard a voice say from the doorway. It was his grandfather. Grandpa Spencer had always hated the name Kermit and insisted on calling him by his middle name. “Hey Big Al!” Every time. With Grandpa Spencer’s accent, it sounded like Abigail. “Have they cut them off yet?” Grandpa Spencer asked, indicating Kermit’s legs. He laughed and walked in, followed by Kermit’s sister, Bobbie Sue, who wheeled herself in in a wheelchair. Her right leg was missing. She pulled out a small, scruffy dog and placed him on the covers. The dog blinked a few times and promptly walked off the bed, landing with a thud on its head. It lay on its back with all four legs in the air for a moment before getting up and wandering around listlessly in a small circle. Grandpa Spencer and Bobbie Sue only stayed for twenty minutes but it was still enough time for Bobbie Sue to accidentally run her wheelchair into a cart of lunches and knock half the trays to the ground. Kermit was almost relieved when they left: there were just too many things to go wrong in a hospital. They left Tookie, although Kermit was pretty sure it was against the rules. They had only been gone a few minutes when a girl appeared at the door. She was cute, with short curly hair. She was wearing camo pants and a black T-shirt and was carrying a neon-pink umbrella. “This is a private room,” Kermit said, with a gesture that asked her to consider if he looked like her grandfather. “Please, just shut up,” Kermit said. He had enough comments like that from the doctors when they were treating him; he didn’t need it from random strangers too. “Well, there’s nothing good about it,” Kermit said, relenting a little from his first impression of her. “Sorry if I startled you,” she said. Despite the cheesy line, he smiled. When she left a few minutes later—with another knee-weakening smile and a promise to return the next day—he hated to see her go. The next day started badly. Tookie wandered off and got himself stuck with a syringe of morphine. It took some hurried intervention by Grandpa Spencer to keep him from being sent to the pound. Nisha arrived just as Grandpa Spencer was carrying off the sleeping, smiling dog, and Kermit introduced them. “He seems nice,” she said, after Grandpa Spencer had left. She did come again—several times a week, in fact, and Kermit did think about the idea. He could admit to himself that he was afraid—terrified, in fact—but he didn’t like being afraid. He hated it. His whole life had been one big defensive maneuver, dodging one potential danger after another—or as often as not, not dodging it. Finally, the week before he was released, he told Nisha that he would do it. He would go spelunking with her. They went together a month later. Nisha picked him up and they drove for three hours out into the mountains on a dirt road. That ended and they walked another half hour to a dark cave mouth protruding from a moss-covered hillside. After they were suited up (Nisha triple-checked Kermit’s harness, with a wink and an amused smile), she led the way down into the darkness. For Kermit, the initial climb down into the flashlit abyss was a mixture of terror and wonderstruck incredulity—terror that he might die at any moment, and incredulity that he had not already died. He fell down four times before they reached the first rest point, but although he was dirty and scraped, he was not bleeding or incapacitated. It seemed like a miracle. 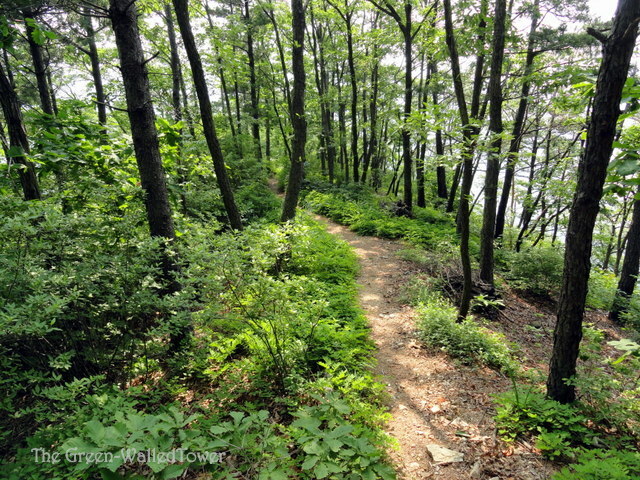 Then came the big climb, an almost vertical drop of a hundred feet. 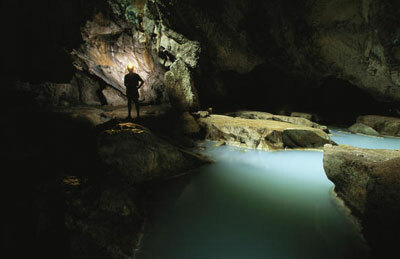 The foot of the cliff sat next to a still pool of dark water. “Do we have to?” Kermit asked, feeling faint at the mere sight. It made Russian roulette look like a safe bet. “Well, we didn’t have to come down here at all,” Nisha said. “Don’t worry—there are lots of handholds and I’ll belay you down and up again. Okay?” He desperately wanted to refuse, but in the face of her indomitable optimism, he just nodded. Somehow, he made it to the bottom. She lowered him slowly while he scrabbled ineffectively at the crevices and cracks in the rock face. She climbed down effortlessly after him and they had a snack at the bottom. After walking around and exploring a little, they decided to go back. “Not my real name. Anyway, take care. Gotta go.” She started to climb, leaving him behind in the darkness. For a moment, he watched her ascend, moving away from him. He had no ropes—not that it would have mattered if he had. He considered his options. He would surely die if he stayed in the cave. He would surely fall if he tried to climb up. Dying by falling would be quicker and the further up he got, the more chance that he would die on impact. He took off his helmet and started to climb. It was strange to be climbing without hope, to be climbing up only because it was the fastest way down. He searched for handholds in the dark, not worrying about how close he was to the top, but only trying to get a minimum distance from the bottom before he fell. Several times, he slipped, but he hung on and pulled himself back up. After a few minutes, he reached up and felt something hard and rubbery. It kicked when he grabbed it. It was Nisha’s boot. He had caught up with her. “What are you doing? Let go of me!” she cried, kicking down at him more ferociously. Her heel smashed against his forehead and he fell back, grasping blindly as he did. He grabbed her boot and heard a shriek as she tumbled over him and down into the darkness. He heard a snap as the rope pulled up savagely on her body and slammed it into the wall. Kermit opened his eyes to see that he was clinging to the rope that was now stretched taut from Nisha’s weight. He also saw that he was within three feet of the top. Miracles abounded that day: he made it to the top. “I’m sorry,” he called down. “I think some of my bad luck rubbed off on you after all. Maybe we just traded.” Then he felt bad and climbed out and called 911. The paramedics came, eventually, and incredibly, Nisha was not dead. A day later, Kermit was in the hospital waiting room with Grandpa Spencer and Bobbie Sue while Nisha was being operated on. Tookie was chewing thoughtfully on a nearby plastic plant when a surgeon came out. “Do you think that strangers are strange? There’s no way to really know. One of the things I love about strangers is that you can’t really know anything about them. Get to know them, you say? Then they’re not strangers, are they?” Francis said all this while gesticulating somewhat ferociously at the woman sitting next to him on the bus. “I’m sorry, I don’t know you,” the woman said. She got up and stood by the door. “That’s my point, exactly,” Francis called after her. “I could be anyone: a movie star, or even an axe murderer.” From the looks he was getting, the passengers on the bus considered the latter to be vastly more likely. But Francis was no axe murder; he just liked to watch people and he felt that he had a gift for telling things about people, just by looking at them. A man got on the bus. He wore a faded leather jacket and a baseball cap that said “USS Missouri”. Francis sized him up. A former sailor? No, it was too obvious. This man was a pirate. He used to be a consultant for the Somali pirates and retired here to live with his harem of semi-legal Chinese immigrant wives. He takes the bus because he always carries a pistol and his road rage is constantly teetering on the edge of erupting, Vesuvius-style. The man put a hand into the pocket of his jacket and gave Francis a meaningful look. Francis looked away quickly. A woman got on at the next stop. She was a gorgeous brunette and wore short shorts and pink midriff top. A former model, Francis thought immediately. She made millions on the runway, but retired after becoming disillusioned with the lifestyle. She rides the bus because she’s looking for a normal guy to settle down with: someone slightly overweight and wearing a clever T-shirt. The woman walked by Francis without even reading his clever T-shirt. Well, it doesn’t always work, he thought. 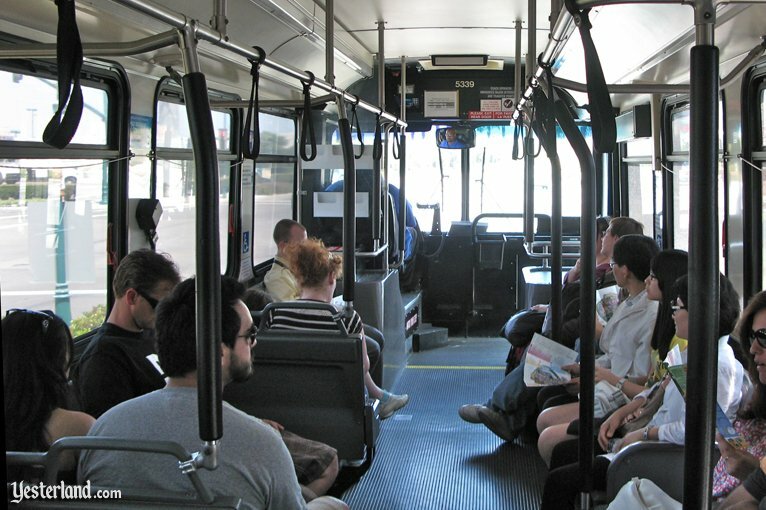 An elderly woman climbed laboriously onto the bus. She didn’t interest Francis much, but he was fascinated by the small poodle she held in her arms. That dog has rabies, Francis thought. It’s taken some medicine for it, so it’s okay now, but any sudden movement and it will Hulk out and start attacking everyone. Even a sneeze will set it off. Francis shifted to the middle of the seat to try to keep the woman and her dangerous poodle from sitting next to him. The next person to get on was a girl in her twenties. She wore glasses and carried a thick stack of books with titles like Molecular Geometry. She sat down next to Francis. What if she’s a terrorist? Francis thought with a chill. What if those books are loaded with explosives and she’s just gotten out a terrorist cell meeting and now she’s on a mission? She probably worships Egyptian deities and has dedicated her life to avenging them for being forgotten by humans. The woman opened the top book and began reading about obtuse angles in sodium hydroxide. Francis looked out the window to find some more strangers to daydream about. The bus was four stops from his house when suddenly the girl next to him jumped up and pulled an Uzi out of a hollowed-out Metaphysical Economics book. He jumped up and pulled a gun out of his pocket, but in the process, jostled the elderly woman with the poodle. The poodle let out a howl and jumped to the floor. It started frothing at the mouth and running around, peeing on everything and trying to bite people’s ankles. Francis tried to make himself smaller as he looked out the window. I have a terrible, terrible gift, he thought. 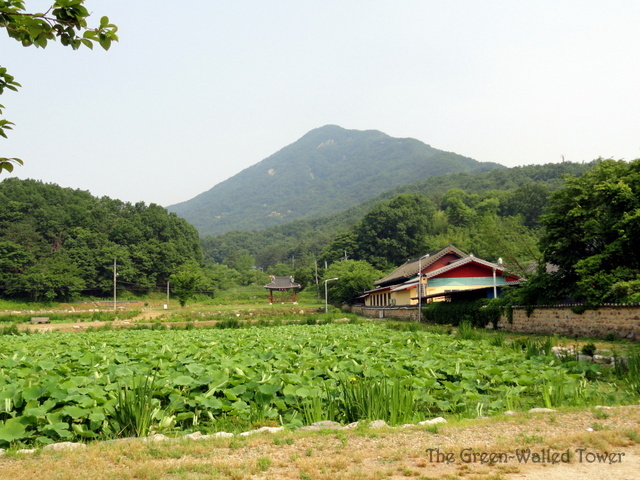 I live in the town of Jeonju, South Korea. It’s a medium-sized city of 650,000 people in the southwest of the country. It has always been famous for being a traditional, historic Korean city. Then they elected a new mayor: Mayor Kwak Min-Gi. He was young for a mayor and had an artistic temperament. He wanted to make Jeonju into a easy-going, free-spirited, stop-and-smell-the-roses sort of city. Not a very Korean ideal and a bit of a hard sell. One innovation was the “karaoke stoplights”. Now, instead of being on timers, each intersection has a song assigned to it. Directional mikes are set up and the side that sings the loudest gets to go next. If you get stuck with a bunch of sullen drivers, you can sit there for twenty minutes or more. People were a little resistant at first, but it slowly caught on. 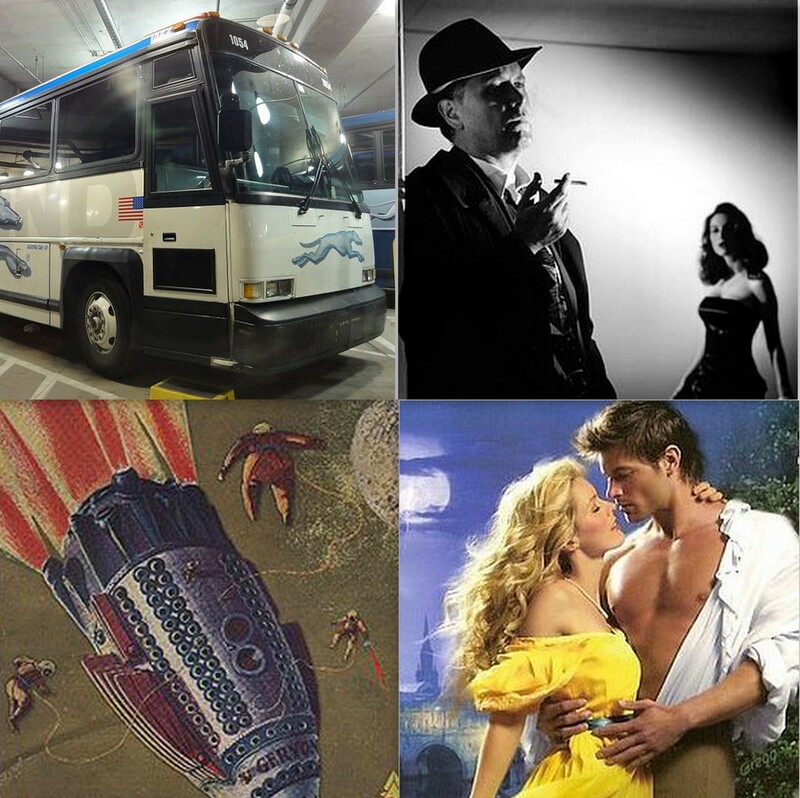 Another innovation was the “artistic vehicle” movement. Cars in Korea are almost complete black, white, or gray. Mayor Kwak offered huge discounts in vehicle taxes to anyone who decorated their own car. Koreans are natural artists and everyone likes to save money, so it didn’t take long to catch on. Now, you can look out on a traffic jam of green, yellow and neon pink cars; cars with Hello Kitty on the hood; cars with childish scribbles on the doors; and vans plastered with the entire casts of Korean dramas. The upside is that it is now very hard to lose your car in a parking lot. 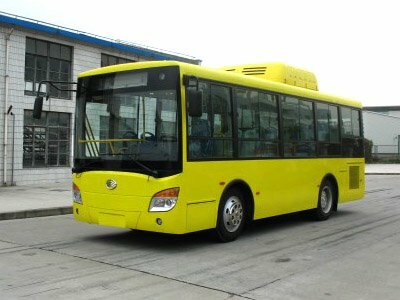 My favorite innovation, however, was the “meanderbuses”. These were buses that did not have a set route. They just went wherever the driver felt like. These took a little longer to become popular and even now, they’re not used a lot. After all, it’s hard to take one to work when you don’t even know where it’s going. Which is precisely the reason I love them. You have to keep your eyes peeled. There are only five meanderbuses for the whole city. You can follow them on Twitter if you want to know where they are currently, or just use the old-fashioned method, which is a group of spotters who keep each other informed. Every time I ride one, I find a new place. Once the bus went out into the mountains on little one-lane roads for about an hour and drove past five toothpick factories in a row. Another time I found the Jeonju Museum of Culinary Snake Meat Substitutes. Who knew? Last Thursday I was waiting at the bus stop to go to work when a meanderbus showed up. Of course I took it and called in sick. It was good that I did too. Mayor Kwak was on that bus, showing off the program to a group of reporters and government officials. They asked me how I liked it and I told them it was great. We cruised around Jeonju for a couple hours and then had lunch at a galbi restaurant that was housed in a former bomb shelter complex, built under Mount Hwasan. I didn’t even know it was there before. A group of friends, Mike, Tom, and Kelsey were traveling to a writers’ meeting when there was an accident. Here are their accounts of the incident. It was raining—not a happy little drizzle, but a carwash set to Super Premium, hold the hot wax. We were traveling down a lonely highway halfway between Nowhere and Who Cares City and had been for over two hours now. I was doing a crossword puzzle and failing miserably at it. Who the hell knew a 7-letter word for domicile goatee anyway? The broad across the aisle had been giving me the sweet-eye for an hour now and I kept giving it right back. She had legs like the Amazon River: long, with lots of curves. I glanced out the window and saw a car was coming up on us, like it wanted to make our acquaintance in a hurry. The passenger side window went down a crack and the barrel of a snub-nosed Luger told me they didn’t want to chat. The bus driver—O’Malley, by his nametag—saw it too and threw the wheel to the left, trying to give the other vehicle the old cold-steel shoulder. The car swerved but O’Malley kept right with him. The front fenders scraped with a shriek of steel like the devil’s nails going down Hell’s blackboard. There was a boom as the Luger fired, hitting our front wheel. O’Malley did his damndest to pull it back under control, but the bus tipped and started to roll. The Amazon across the aisle fell into my lap. I put an arm around her waist and held on as passengers and baggage got thrown hither and yon. I knew I was probably going to die, but what a way to go. The Imperion-class space frigate, Reyhoun, rocketed down the warp-path towards the Orion nebula. Captain Dax Harflux piloted the 800-ton frigate with cool confidence that came with eight years of experience in the Galactic Commonwealth. This was his last trip of the cycle, transporting dignitaries and Fagullian wine to the nebula colonies. A beeping sounded from his instrument panel. Holy meteors! A Narullion pirate craft had been detected 40km behind them and coming up fast. He had to evade it, but how? He was locked into following the warp-path until he hit the nebula jump-gate. He accelerated, sending sparks of anti-matter shooting from his proton-powered nacelles. The Narullion pirate was approaching rapidly on his port side, firing crackling beams of scarlet energy. Captain Dax strengthened the shields but they had already lost half their power. Another beam hit and the ship lurched to one side. The pirates had gotten the gravity generators and inertial dampeners! The whole ship started to roll and with a burst of white light, they flew off the warp-path. With his last burst of energy, Captain Dax hit the emergency distress button. He might die with his ship, but the pirates could never get their filthy hands on the dignitaries or his cargo of Fagullian wine! I sat listlessly by the window and watched the rain glisten down the glass. Today was the one-year anniversary of my beloved being killed in action but my heart still yearned for his gentle touch and the feel of his strong arms around me. Life had been drained of color since I had watched him leave for basic training in a bus much like this one. There was a flash of yellow next to the bus and I saw a convertible pull up next to the bus and stay there. I was seated directly behind the bus driver and I saw him slow to let the slick sports car pass, but still it stayed with us. Then to my astonishment, the convertible’s roof began to retract and a man stood up in the passenger’s seat. He was wearing a battered Army uniform but his head was bare and the rain soaked his soft brown locks in seconds. I let out a gasp as I saw that it looked like my beloved. He smiled and I knew it was him. That smile, even seen through a rainy bus window going 50 miles an hour, still filled me with chills. I did not know how, but it was he, back from the dead. I flung open the bus window and leaned out, heedless of the rain and extreme danger. “A clerical error!” he shouted joyfully again. I let out a sigh. Clerical error. From then on, those two simple words would be the happiest words in the English language for me. He pulled a box out of his pocket and opened it, proffering the contents. “Would you do the honor of marrying me?” he shouted. I fear that I fainted at that point and, it seems, collapsed onto the bus driver. With my last sensation, I felt the bus swerve and then I was thrown into weightlessness, like an angel settling gently to Earth. 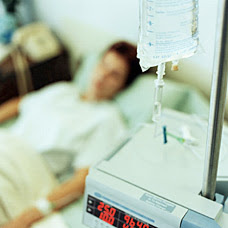 I woke up in the hospital, with my beloved sitting next to me, a diamond ring on my finger. Oh, but I was the happiest woman in the world! A Greyhound bus traveling westward on highway 16 side-swiped a car, hit the curb and rolled once. The cause of the crash is said to be mechanical. Nine people were treated for minor injuries at the Bergerville Central Hospital.